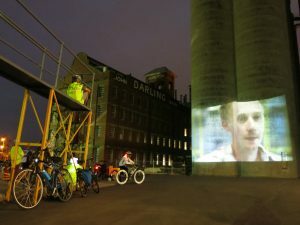 Projector Bike has a new home at Site Works at Saxon Street in Brunswick! Come on down to meet your local cycling community, and join us on a Projector Bike group ride packed with award winning short films, adventure, and music as we roll! Projector Bike leaves Site Works and takes a ride through Moreland searching for secret screening locations, and comfy surfaces to perch upon, whilst we gorge on fun and fresh short films! Showing award-winning short films with a fresh playlist every week, join us as we meander through Moreland on a unique once off magical mystery tour. Bring your bike and meet at or catch up with us via Twitter updates. Projector Bike will be situated in the main grounds playing the wonderful sounds of local community radio stations PBS, 3CR, and RRR.